The Giordano’s Libero Acciao is an Italian inspired road bike. It is for beginners and novices who want to take up road biking. This model is strong, durable and has that great combination of classic yet stunning modern look. Most importantly, it is affordable. This bike’s frame and fork is made of high tensile steel, which is fitting since “Acciao” means steel in Italian. The steel is durable, but light enough to speed past other bikers. It is heavier than aluminum frame bikes. But if you compare the Giordano Libero to other bikes with the same construction, this is better and much faster. The handle bars are in an ideal position. You won’t feel too slumped over. Because of that you’ll always have a great posture while riding. You don’t have to reach out of the handles and bend too much. You can sit and ride comfortably. The bike has to be assembled by someone experienced. There are lots of cables, screws, and adjustments. If not, you might encounter some problems. The most common problem riders would face is their transmission malfunctioning. It will be rough to change gears. You’ll hear some strange noise from the drive train. Sometimes they aren’t able to change gears at all. For the price, this bike is a steal. But you have to understand that almost all entry level bicycles will have problems. That’s why it is best to bring it to the shop and make it fine-tuned to your needs and requirements. We recommend going to authorized bike shops and not a retail store with a bike technician. Go to Walmart, REI and etc. You’ll see the difference after a few miles. In some instances, with an expert technician, it will still run like new after 500 miles of use. The Giordano Libero is rough around the edges. But with some few adjustments and modifications, this can be transformed into a bike experienced riders will be proud of. 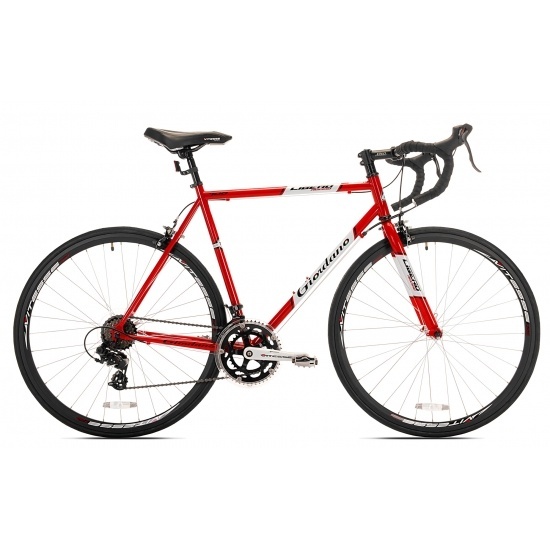 The Giordano Libero has some features of the more expensive bikes. Most of the components are great. Its rims and gear are top quality. 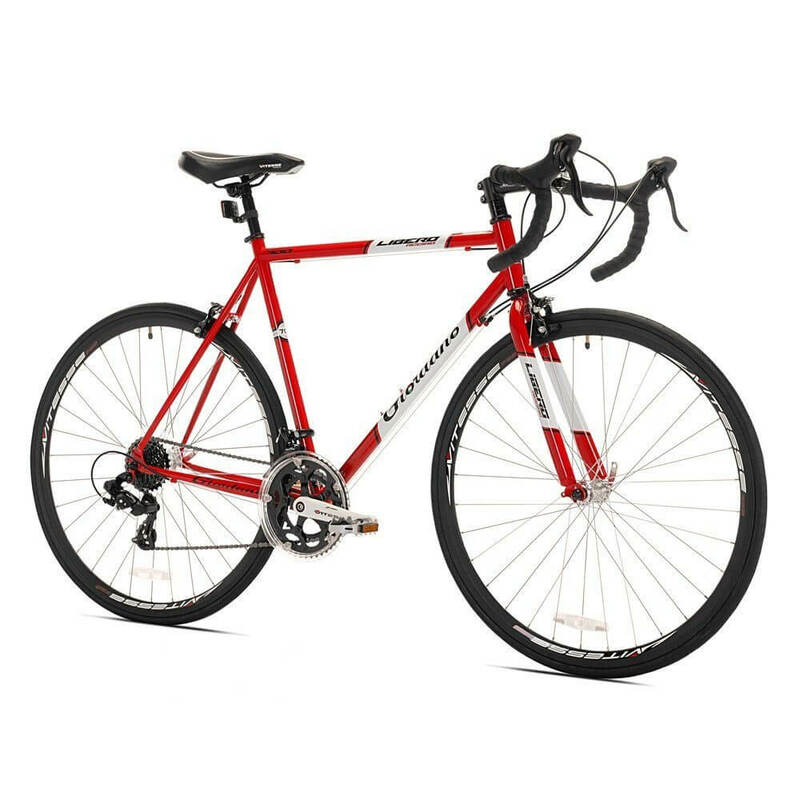 It has the 14-speed Shimano Tourney STI drive train that guarantees a smooth experience while changing gears. The overall design also looks fantastic. You’ll also have brake level shifters and a quick release wheel for quick storage. While some components are great, there are some terrible ones too. For example, the aluminum wheels. Some also complain about the seat, which they say “needs getting used to.” Apart from that, there isn’t much to complain about. But with all that’s said, the good components definitely outweigh the bad. The Gioradano Liber bike is not Tour De France material. It is for everyday road biking for beginners and novices. You should have this in mind if you will buy this. This is a solid inexpensive bike for casual riding. Many beginners and enthusiasts love it because of that. For the price, it provides great value. That’s why it is easy to understand that it’s one of the highest rated bikes on Amazon. The steel frame and fork makes it a good bike for rugged terrains. If you’re into road biking, this is easy to store and transport around without hassle. For the price, you’ll get top quality components that you normally see in more expensive bikes. It delivers great value for the price. You’ll see some more expensive bikes with the same features as this bike. Assembling the bike is difficult if you’re not a pro. If you manage to assemble it alone, you might run into some problems while on the road. We recommend taking this to a bike shop and have it adjusted to your requirements and specifications. As mentioned earlier, not all components are good. If you don’t like them, you can simply buy and replace them. For those who don’t want to spend 1,000 on a bike. If you buy this, you’ll have a road bike with decent specifications at a mid-range price. Needs professional tune up to get the most out of it. A great road bike. Just have a pro tune it up. It has some minor issues. But overall, a great starting bike who is trying to understand road bikes. This is functional and specifically made for beginners and novices. It is light weight, despite being made of steel, and is quick to store.